Region: This fly can be found in various species throughout North America. Life cycle: This insect produces numerous generations each year and hibernates as a larvae in the body of host insects. 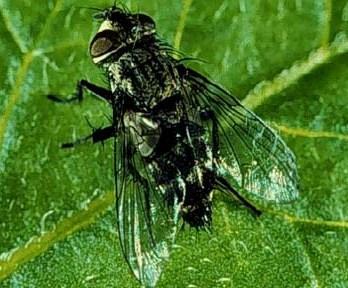 Physical Description: This 1/3 to 1/2 inch long fly is gray or brown with pale markings, and is a strong flier and can be seen walking rapidly on the surfaces of plants. The larva is gray to greenish white and is thick bodied with spines. The white eggs are laid on foliage or on the body of host insects. Feeding characteristics: The adult fly feed on nectar and honeydew. 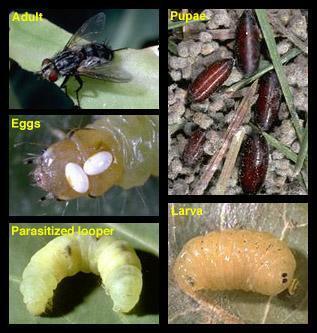 The larvae are internal parasites of such insects as beetles, bug species, caterpillars, grasshoppers, and sawflies. They feed on the inside of the body by sucking its fluids and eventually killing the insect.